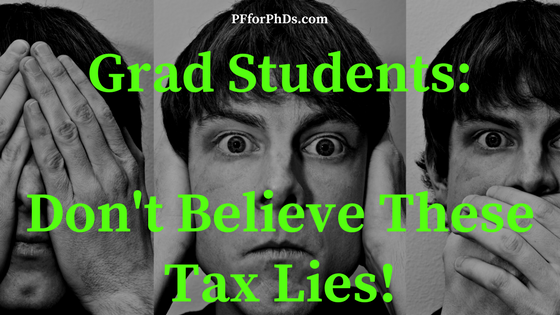 Grad Students, Don’t Believe These Tax Lies! The purpose of this series is to examine the lies or rumors about taxes that grad students frequently hear from their peers or family and friends. There is a lot of tax misinformation floating around universities, which ultimately be damaging to grad students who believe it if it causes them to file inaccurate tax returns. Sometimes a lie will be true for a subset of graduate students but not true for another subset, depending on how they are paid, which adds to the confusion. ‘Lie’ is of course a strong term, and I’m using it a bit tongue-in-cheek. You might call them not-quite-true statements from well-intentioned people! Virtually all of these tax lies arise from someone applying their understanding of other parts of the tax code – accurate or inaccurate – to grad student income and particularly non-compensatory income. In the cases you’ll read about in this series, the logic unfortunately does not transfer to the (sometimes) special case of grad student income. 1. You don’t have to pay income tax. 2. You received a 1099-MISC; you are self-employed. 5. If nothing was withheld, you don’t owe any tax. 6. You don’t have to pay tax on the money that pays your health insurance premium. 7. You can take a moving expenses deduction for your moving costs to grad school. 8. You can claim the earned income tax credit. 9. Everyone can contribute to IRAs, even grad students with stipends. 10. Grad students have low incomes, so they are eligible for the Saver’s credit. If you have another (possible) lie you would like to see in the series, let me know through social media or email (emily@PFforPhDs.com). This series is an expansion of Tax Lies Told to Graduate Students on Evolving Personal Finance. this is helpful. 1099 misc, box 7 is a very bad form to get and it make no sense. Well, graduate students shouldn’t receive a 1099-MISC with box 7 income for their role as graduate students. That would likely only happen if they had negotiated for some work as an independent contractor. That would trigger self-employment taxes as well. Graduate students with fellowships, on the other hand, might receive a 1099-MISC with box 3 income.